All our products are built with quality in mind to ensure they stand the test of time and dont let you down. We can assure any potential customers that our products are manufactured from high quality branded materials and will fulfil their expected lifeline. Furthermore, and perhaps more importantly; all our products have been thoroughly inspected in European based test labs to ensure they meet all the required safety standards. We are fast and free! If you place an order before 13:00 you will receive your order the following day (excludes weekends). 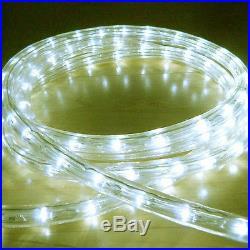 FULLY WATERPROOF MULTI - FUNCTION LED ROPE LIGHT IN Warm White (8 flashing effects). These LED rope lights are manufactured to the highest possible standards making them an ideal item for transforming various types of objects. The rope light uses high quality LED chips which emit a great output of light as well as being very reliable. LED rope lights are very popular for a wide range of projects such as path lighting, garden lighting, Christmas / wedding lighting, etc... The product has a massive 36 super bright LEDs per metre with an estimated 50,000hr lifeline. The item is very flexible and easy to work with as rope lights operate at mains voltage so you dont require any transformers, etc. The rope light has some fantastic effects to choose from such as flashing, fading, twinkle, etc... As well as having a static option. Our rope lights also have a built in memory so when you turn them off at the mains they remain on the last setting rather than defaulting back to flashing which is great when the controller isnt easy to access... In our opinion these rope lights are the best available as they are manufactured from one of the largest decorative lighting companies and we currently have them on offer at amazing prices! Due to the high quality of our products and installation service we offer our items are regularly used in some of the UKs largest shopping centres, hotels, Celebrity homes, etc... This listing is for a cut to length rope light allowing you to choose the length you require to suit your project perfectly. The rope light can be cut every 2 metres and you can select your required length from the drop down menu above. Regardless of the length you choose, the item will come complete with the IP68 waterpoof Controller / Powercord meaning no additional items are required to power the item. HIGHEST QUALITY LED ROPE LIGHT!!! Please see the below feedback from our recent sales of led rope lights to back up the above statement... As we are a UK based company, you will incur no further expense once you have paid for the item, i. COMPANY NUMBER: 9167881 VAT NUMBER: 193209013. The item "WARM WHITE LED ROPE LIGHT OUTDOOR LIGHTS CHASING STATIC CHRISTMAS XMAS GARDENS" is in sale since Wednesday, December 18, 2013. This item is in the category "Home, Furniture & DIY\Celebrations & Occasions\Christmas Decorations & Trees\Christmas Lights".